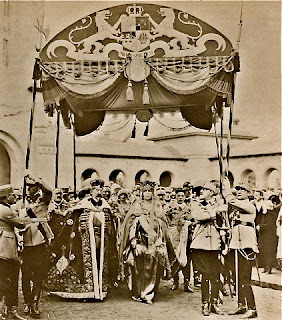 This is a crowning of Queen Maria of Romania, in the "heart" of Transylvania, Alba Iluia. It must have been pretty impressive to have been there. What most people forget is that they became king and Queen of Romania in 1914, at the beginning of World War I and were not crowned until 1922. There is so much about Queen Marie which has been said but not much about the places she lived, except Alba Iluia, which is one of the more important cities in Transylvania. She also did posses and leave to her descendant Bran Castles which still looks as much as it did when it was built.